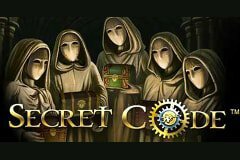 If you’ve always been interested in secret societies and the inner workings of the mysterious group dubbed the Illuminati now is your opportunity to infiltrate them and crack the code to reveal their most sordid secrets for riches worth up to 400,000 coins! As you go in search of clues you will find yourself inside a historic religious building that resembles a church with large stone statues adorning the reels and intricate designs etched on the walls as you try to gain the trust of the leaders of the society who are hell bent on controlling world affairs and gaining influence through positions of power in order to create a New World Order. Unlike how online slot machines work in most cases, the Secret Code slot machine has been developed by Net Entertainment and contains a skill stop feature so you can make the reels stop instantly rather than waiting for them to fall into place in their own time, with the action taking place across 5 reels and 20 paylines with joining fees to gain acceptance into the secret society costing from 20p up to £50! Gaining acceptance into the group will see you come face-to-face with the leader who greets you in his hooded robe clutching hold of a knife in a thinly veiled threat as to what will happen to you should you disclose the groups secrets. This figure acts as the Wild symbol and he has the power to stand in for Scatter and Bonus symbols, plus whenever he makes his presence known on the second, third or fourth reels he becomes an Expanding Wild symbol to cover the whole reel. You’ll also encounter an old gentleman who is inspecting a piece of paper in an attempt to unlock the ultimate secrets once and for all and he is the most valuable symbol on the reels, plus you will meet a female who has found an ancient neon green jewel, there is an open book with magnifying glass to identify cryptic clues, an hourglass, three rings for members, and three secret icons that only members will understand. To infiltrate the secret society and discover their secrets for big rewards you’ll need to land the Bonus symbol (key in the lock) on the third, fourth and fifth reels at the same time before you are whisked away to another screen in this simple yet rewarding pick ‘em feature. You will find yourself in a secret dark room with five masked figures from the mysterious group who are all wearing robes with the hood up as they each clutch hold of locked wooden box. There are five keys displayed on screen and your job is to pick one of the keys to drag and drop it on the box that you’d like to open with it – and thankfully they always open up, but some are much more valuable than others. The figures mask will then be unveiled and you will either see a beaming light from the box as an angel is unmasked or else red mist that rises from it as a demon is unmasked. If it’s an angel you see you will enjoy a cash prize as you edge closer to the inner circle of the movement, however a demon brings no prizes so you’ll hope to avoid these if possible. To conclude this feature all of your prizes are added together and you are then prompted with a gamble feature offering you the chance to collect your winnings, risk half of them to double up, or to risk them all, with the key to doing so being opening the correct box and revealing an angel. Deciphering the X.O.R.N.S.T.O message (Scatter) will see you delve deeper into the inner sanctum of the movement where you will enjoy perks in the form of a free spins bonus feature which never fails to result in big wins thanks to sensational multiplier bonuses. You will find yourself in a secret room that contains twenty stones that are being guarded by a Druid who offers you the chance to select between three and five of the stones in order to reveal a number of free spins which are added together, plus a multiplier bonus worth between 1x and a jaw-dropping 20x will be applied to all of the winning combinations that are made as you spin the reels for free, plus every time you land two or more Scatter symbols your multiplier value will further increase! After gaining the trust of leaders you’ll have access to all sorts of historic books to discover clues and crack the code to reveal their closest guarded secrets for big rewards so get cracking!